The authors of this book bring to it a lifetime of scholarly research on religion in Australian history. Piggin is a Fellow of the Royal Historical Society and of the Religious History Association of Australia. Linder is the Distinguished Professor of History at Kansas State University. His long interest in Australian religious history began with his visit here in 1987 as a Fulbright Scholar. Protestant churches have not received the same attention in Australian history as has the Catholic Church. It would be misleading, though, to suggest, that Piggin and Linder in this volume are directly attempting to fill that gap. They have instead undertaken to explore a theological movement that stretches across a diversity of churches, extending beyond ecclesial structures to include the involvement of lay evangelicals in economic, political and social aspects of colonial life. Nor is this a history structured by the boundaries of the ‘secular’ and the ‘sacred’, but rather one that highlights the porous character of such boundaries. According to the authors, ‘This book is primarily the story of how the evangelical movement has helped shape Australian history. 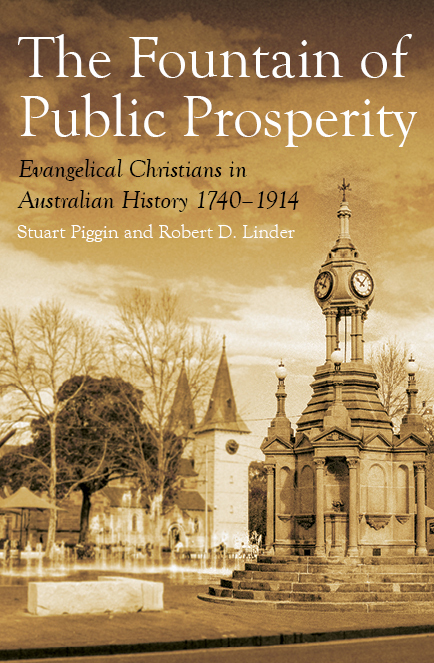 It is secondarily the story of how the evangelical movement has been shaped by its Australian context (p. 12).’ The authors suggest that both stories have largely been untold up till now but need to be told because they are important for developing a fully-rounded understanding of Australian history. These stories should be part of the historiographical mainstream, whatever a historian’s personal views about Christianity in general or evangelicalism in particular. In adding to the official historical record – as they do in substantial detail – Piggin and Linder shift attention in Australian history well beyond the current obsessions with military history and onto issues of political and economic development and the creation of popular movements for social change throughout the 19th century. But why have these stories not yet become part of mainstream Australian history? The authors offer three possible reasons. The first [reason] is that the history profession has been too secular to understand or appreciate the significance of the [evangelical] movement. The second is that it is the fault of evangelicals themselves; they have not been interested in their own history. The third is that it is no-one’s fault: it is just too hard to conceptualise and evangelicals too difficult to identify (p. 12). From my experience in researching the role of church-related agencies in social welfare in Australia the uncritical acceptance of secularisation as a master narrative meant there was limited scholarly research on evangelicals. There seemed to be a general attitude of ‘Nothing to see here so let’s move on’ with respect to the issue. It certainly seems plausible that this might also be the case with regard to Australian history generally. Providing a working account of evangelicalism requires familiarity with both theology and church history. Both Piggin and Linder are clearly comfortable in engaging in this field and are alert to the importance of apparently small differences in theological position within the evangelical movement. They are able to map shifting theological emphases and identify their influence on stances toward political and social issues in the 19th century. The authors avoid the anachronism of reading mid to late 20th century fundamentalism back into 18th and 19th century evangelicalism. They are clearly sympathetic with liberal and socially-engaged evangelicalism and they map carefully the dynamics that led to tensions in the movement and the emergence of fundamentalism as a distinct wing in the early decades of the 20th century. So who were the evangelicals? The study works with a pragmatic acceptance of an evangelical as anyone who during the period under study was happy to so self-identify, while it also allows for a diversity of styles of evangelicalism. In justifying the substance of such claims, the authors provide a good deal of evidence of connections with other evangelicals and involvements in evangelical movements and causes. They work with the main characteristics of evangelicalism as articulated by the British historian David Bebbington – ‘conversionism’, ‘activism’, ‘Biblicism’ – and a theological centring on the sacrifice of Christ on the cross. In attempting to answer these questions, there is a tension in the presentation between the well-researched and highly detailed accounts that it provides of events, organisations and individuals, and the authors’ concern to make a wider historical argument about the role of and significance of evangelical Christians in the convict era and the development of the colonies. Shifts in style and voice lead at times to slightly disconcerting interruptions in the flow of the narrative. What is engaging despite this is the authors’ obvious interest in the people whose stories they tell, and the richness of detail in the accounts of the individual lives and social experience. The authors are concerned to encourage the move from a binary model of conflict – bosses versus workers, men versus women, whites versus blacks. They want to shift to a way of writing Australian history that involves a weaving of diverse threads in a larger tapestry that will include the threads of religion, race, gender and class. This will open up fresh insights into neglected aspects of Australian society. The white settlement of Australia was an extremely ambitious attempt at a humanitarian reform experiment shaped strongly by evangelical interests. Evangelicals were prominent among those who pushed for the development of participatory and increasingly democratic capitalist economies in the colonies. Evangelical Christianity was a coalition of sometimes competing and sometimes cooperative siblings. The rivalry led to what the authors describe as a pattern of ‘sanctified competition’ producing in the field of religion in the colonial settlement what Capitalism did in the world of commerce. Evangelical faith was a strong supporter of ‘settlerism’, the process of moving to a new land with the intention of personal and social improvement, without breaking ties to the old world and accompanied by the belief that one should reproduce in the new colonial world what was best in the culture and values of the old. 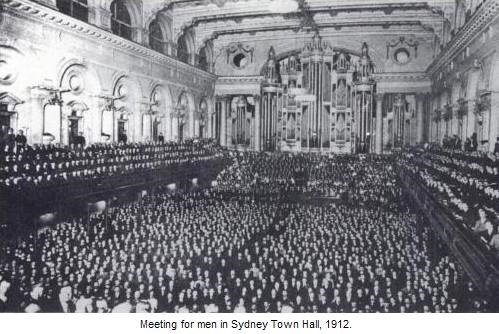 Religious revivals in Australia were more common than has been generally assumed, and they sent ‘tremors of transcendence’ through Australian social and religious life, while generating substantial missionary enterprises throughout Asia. The drive for Federation paralleled the move towards national union in and between Christian denominations. Recent studies have highlighted the importance of religion and religious language, with rhetoric steeped in the prophets and the apocalypse in evangelical support for Federation. * Dr Douglas Hynd is Adjunct Research Fellow, Australian Centre for Christianity and Culture. Apart from this review and his recent review of Saints and Stirrers, he has written a number of articles for Honest History on the links between commemoration and religion. Use our Search engine.